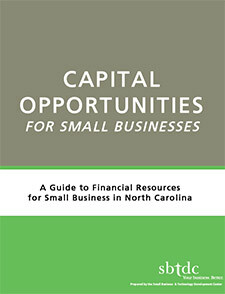 The SBTDC’s Capital Opportunities for Small Businesses provides information about financial resources available to small businesses in North Carolina. The SBTDC publishes this in an effort to support the growth of North Carolina’s economy and to educate and serve the small business community. Capital Opportunities serves as a resource for individuals seeking start-up financing, businesses hunting for expansion capital, and organizations that aid small businesses in obtaining financing. Each funding source is briefly identified and accompanied by a list of contacts. This free guide also describes recent developments that may affect the availability of funding or the eligibility of small businesses to access capital. FEEDBACK? If you have any suggestions or questions about this guide, please call (919) 715-7272 or e-mail info@sbtdc.org.